It's time for our traditional winter break, when we give staffers time to shovel their driveways and readers time to catch up on back issues of HCN.Our next issue should reach your mailboxes around Jan. 21. Writing and editing a cover story can take months, but even with all that lead time it can still come down to a deadline sprint, with editors and proofreaders racing to clean up ambiguous and clunky language before print day. It helps if the story's author is in the office to answer last-minute questions, which is why we were so glad to have Ray Ring here the first week of December. Before flying down to Paonia from Bozeman, Mont., HCN's Northern Rockies editor had already done most of the legwork for this issue's provocative cover story on Montana's environmental movement. That made it almost painless for editorial staff to put finishing touches on the story that emerged from Ray's more than 40 interviews and long research hours on the Web and in various libraries. For all his work, and for his wry sense of humor, we thank Ray. Members of HCN's extended family have a lot to say these days. Trinity University history professor Char Miller, who edited our recent book Water in the West, has published a book of his own. Gifford Pinchot and the Making of Modern Environmentalism, a reconsideration of the first chief of the U.S. Forest Service, has just been released by Island Press. Paonia photographer Celia Roberts, whose photos of migrant workers have appeared in HCN, has published her third bilingual calendar. Gracias por las Familias features black-and-white photos of farmworkers and their families. To order a copy, call Roberts at 970/527-4457 or e-mail her at [email protected]. Dewey Vanderhoff has been taking pictures for HCN for more than two decades. In late November, he finally got to attend a staff meeting. 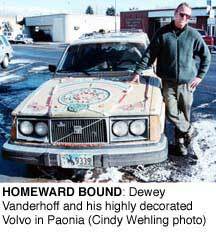 Dewey had just driven his gaily painted Volvo from Guanajuato, Mexico, and he entertained us with stories of his travel south of the border. After the staff made him promise to send more photos - and maybe even prose - he headed home to Cody, Wyo. Dewey, a fourth-generation Wyomingite, is a freelance photographer and publisher of the satirical Cody Boobyprise. The day after Thanksgiving, New Mexico author Malcolm Ebright and his family found a rather quiet HCN office. Luckily, staffer Rita Murphy was able to show them the shop. Malcolm, the president of the Center for Land Grant Studies, kindly dropped off a copy of his book Land Grants and Lawsuits in Northern New Mexico. Ilan Shamir, a poet, artist and writer from Fort Collins, Colo., also stopped by to give us some gifts: his books Advice from a Tree and PoetTree: The Wilderness I Am. Ilan has a Web site, www.replanttrees.org, where visitors can calculate the number of trees required for their personal paper use. Leland Stanley, a subscriber and retired physician from Cody, Wyo., recently took a tour of the office and gave us his perspective on his home state: Wyoming, he says, is "in the pocket of business and industry." Subscribers Bob Child and Dorine Greene of Oceanside, Calif., visited on their way to Snowmass, Colo. Bob is a former Pitkin County, Colo., commissioner and Dorine is a watercolor artist. Radio High Country News has reached the coast - again! KAOS, heard at 89.3 in Washington state (Olympia, Tumwater, Lacey and Tacoma) will carry the program on Friday afternoons at 2:30. For you early risers in the Northern Rockies, Yellowstone Public Radio will air Radio HCN on Sundays at 6:30 a.m. YPR can be heard on over 30 frequencies throughout Montana and northern Wyoming. Visit our Web site, www.hcn.org, for a complete list of stations and air times. Send info about where you'd like to hear us to Adam Burke, Radio HCN, P.O. Box 1090, Paonia, CO 81428 or [email protected]. Associate editor Rebecca Clarren's cover story "No refuge in the Klamath Basin" (HCN, 8/13/01: No refuge in the Klamath Basin) was given an honorable mention by the John B. Oakes award for environmental journalism. That means no cash prize, but a really nice plaque. The award went to the Seattle Intelligencer for a series on mining in the West.